Top5.com has an advertising relationship with some of the offers included on this page. However, the rankings and listings of our reviews, tools and all other content are based on objective analysis. Top5.com does not always include all service companies or products available in the marketplace. Top5.com strives to keep its information accurate and up to date. The information in our reviews could be different from what you find when visiting a service provider or a specific product's website. The Breville Smart Oven has 9 preset functions. It’s a modern, medium-sized toaster and has easy to use knobs and an easy to read digital display. It’s great for maintaining temperature. If you’re seeking a toaster than can double as an oven (including roasting a chicken), check out the Cuisinart TOB-260N1.It’s large, so only recommended for kitchens with plenty of counter space. With two racks and an interior that can fit 9″ x 13″ baking pans, it has 15 cooking functions. 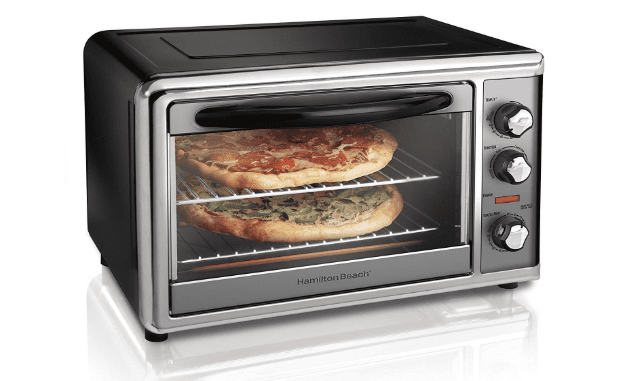 The Hamilton Beach Convection Oven is our favorite convection oven for a few key reasons: easy to use knobs, an affordable price, and the ability to fit two racks. Looking for a compact convection toaster that can be used for toast, prepping frozen snacks, and heating other small items? Check out the Panasonic NB-G110P-K Toaster Oven. At 1300 watts, it heats up to 500°F and cooks faster than most conventional toasters ovens thanks to its FlashXpress instant heating technology. 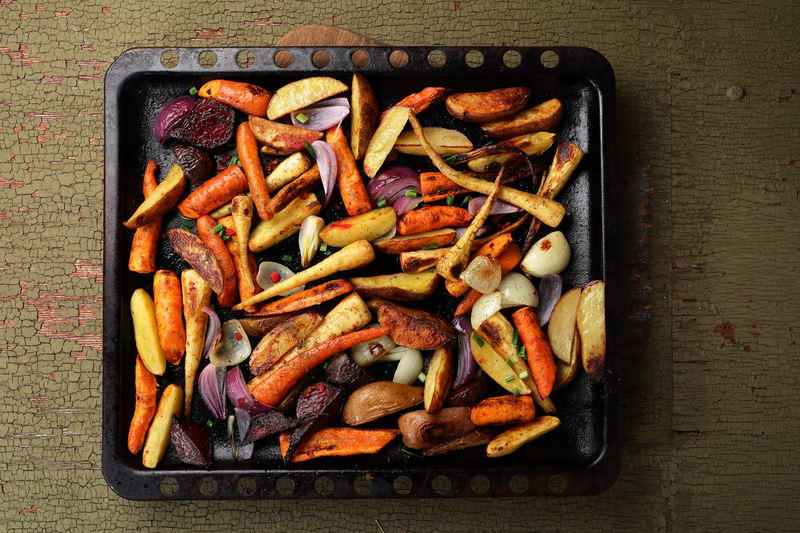 Pre-set cooking settings for common foods making heating up your favorites easy. Looking for an affordable toaster? Check out The Hamilton Beach Countertop Toaster. It easily fits most kitchens and has bake, broil, and toast functions, a roll up lid, and can fit 6 pieces of bread. Bake, broil & toast functions. Let’s talk toasters. They’re not just for sliced bread, bagels, pop tarts, and waffles anymore. 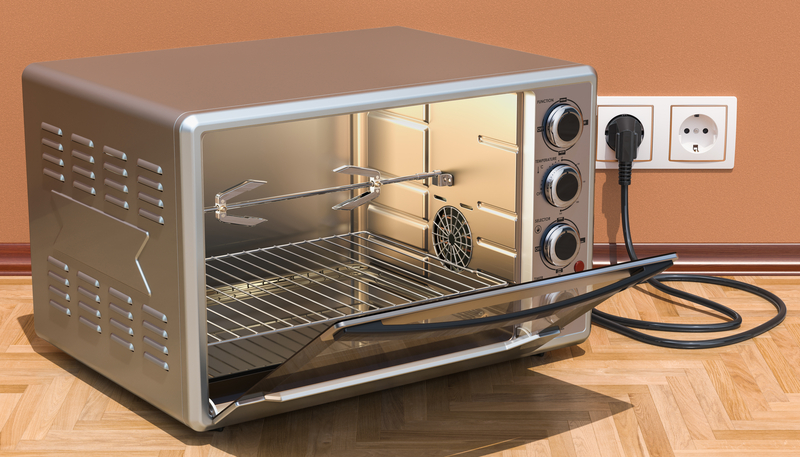 Toasters can be used to bake pizzas, cookies – even rotisserie chickens! Some toasters can be used for pretty much anything a regular oven can (with some size restrictions, obviously). If you’re in the market for a new toaster, the first question you’ll need to ask yourself is why you need a toaster and what you’ll use it for. If your goal is simply to make pumpernickel toast for breakfast each morning, a traditional pop-up toaster should suffice. However, if you want a toaster that can do a bit more (bake cookies, make a roast, etc), you may want to look at countertop toaster ovens or convention toasters. Pop-up toasters are your stereotypical, traditional toaster. They’re great for toasting bread, waffles, and other thin slices of bread-like food. They’re also the most affordable (and limited) type of toaster. A traditional counter toaster is the next step up from a pop-up toaster. 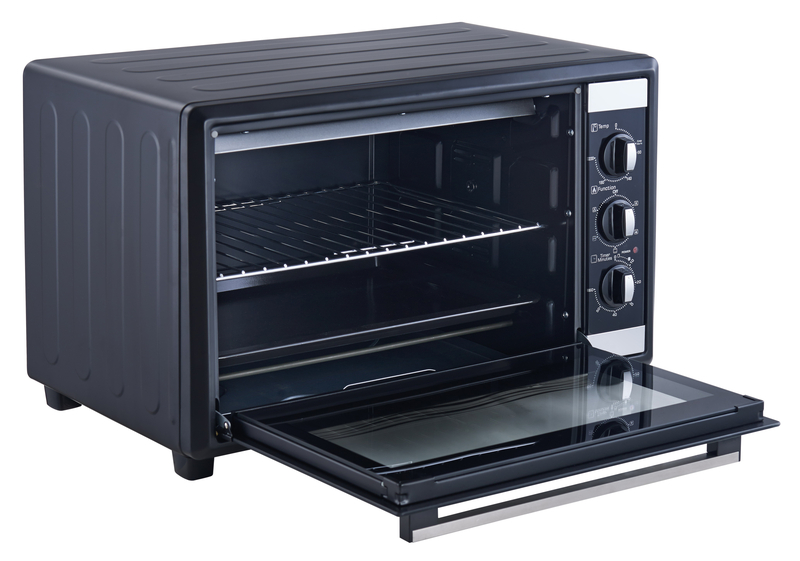 It’s basically a small oven that sits on your counter and can bake, broil, toast, and more. You can make cookies, nachos, and other items you would traditionally use an oven for. Plus it can make waffles, toast, and everything else a pop-up toaster can. A convection toaster is the third type of toaster, as well as the most advanced. It looks nearly identical to a traditional counter toaster from the outside, with one small difference on the inside: a fan. It also performs all of the same functions as a regular toaster and then some (some can even make rotisserie chickens!). The key difference between a traditional toaster and a convection toaster is how it cooks the food. What’s the difference between a toaster and a convention toaster? While a convection toaster has these three heat elements, it has a bonus one as well: a built-in fan. This fan forces warm air to circulate throughout the interior of the toaster increases the temperature of your toaster, removes moisture and aids in the browning process (perfect for roasted brussel sprouts), and cooks food faster and at an evener temperature throughout. Of course, there are pros and cons to both pop-up toasters as well as traditional counter toasters and convection counter toasters. We’ll start by sharing a few of our favorite toasters with you and then getting into the nitty-gritty. 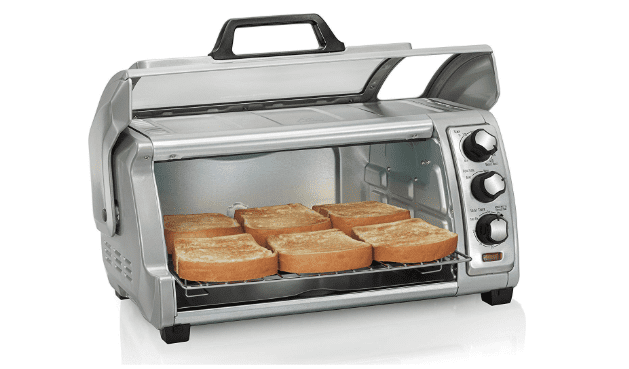 This 1800 watt convection toaster is a bit pricier than others on our list, but it’s worth it. 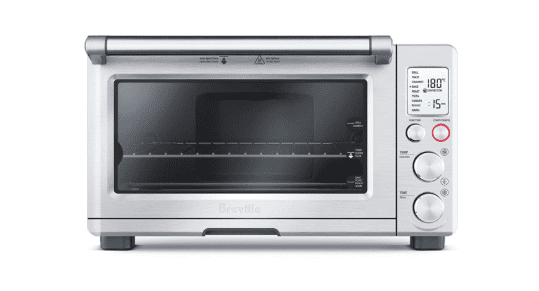 With 9 preset functions, the Breville Smart Oven is a modern, medium-sized toaster with easy to use knobs and an easy to read digital display. It also excels in maintaining temperature (especially for baking cookies and melting cheese). If you’re looking for a cheap toaster, a pop-up toaster will be your best bet, but the truth is we prefer toaster ovens and convection ovens. They’re not that much more expensive than pop-ups and the value add of the baking functions make it worth it. The Hamilton Beach Countertop Toaster fits easily on counters and measures 9.41″ H x 18.74″ W X 15.24″ D. It has bake, broil, and toast functions, a roll-up lid, and can fit 6 pieces of bread. 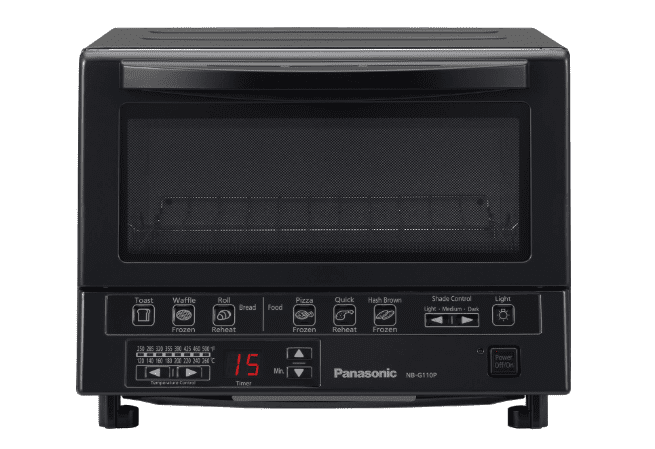 If you’re looking for a toaster oven that won’t take up too much space and can be used for toast, prepping frozen snacks, and heating other small items, check out the Panasonic NB-G110P-K Toaster Oven. The digital console has six preset modes: toast, frozen waffles, frozen pizza, frozen hash browns, frozen rolls and quick reheat. It’s 1300 watts and heats up to 500°F. It cooks faster than most conventional toasters ovens thanks to its FlashXpress instant heating technology. The toaster is smaller than many counter toasters and has a removable 9-inch baking tray. Interior dimensions are 10-1/8-inch x 13-inch x 12-inch. 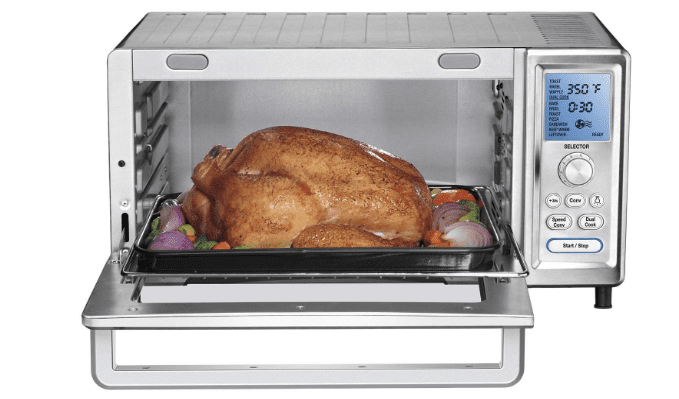 If space isn’t an issue and you’re looking for a toaster oven that can pretty much do everything your actual oven can (including roast a chicken), check out the Cuisinart TOB-260N1. It’s big, so make sure you’re comfortable donating that much of your counter space to a toaster. With two racks and an interior that can fit 9″ x 13″ baking pans, it has 15 cooking functions. It features easy to use digital controls with a large blue backlit display and LED buttons. We love this Hamilton Beach Convection Oven for a few key reasons, one of them being easy to use knobs. While most of the toasters on our list have digital interfaces, this one is an old fashioned knob toaster. If you want a quality convection oven toaster that’s easy to use (especially for the non-tech savvy), then this is the best toaster for you. This toasts can fit two racks and accommodate a 5lb roast or rotisserie chicken. We’ve already outlined the differences between a pop-up toaster, a traditional counter toaster, and a convection toaster, but now let’s compare them side to side. With a convection toaster oven, you can make four slices of toast at a time. With a pop-up toaster, you can only make two. Convection toasters enable you to make more than toast, waffles, and other flatbreads! Sometimes even bagels have problems fitting into pop-up toasters. With convection toasters, you can toast two full bagels at once, as well as heat up chicken nuggets, bake small pies, and so much more. In summary, a convection toaster is very similar to a counter toaster. It looks the same from the outside, but thanks to an interior fan, cooks your food differently than a traditional toaster. We love convection toasters because of how well they cook food, but there is a downside: they’re big. Counter toasters and convection oven toasters are significantly larger than pop-up toasters. Thus, if counter space is an issue, you may want to invest in a small pop-up toaster and use your oven for baking and cooking items you otherwise would have used a traditional counter toaster to do. If you’re trying to cut down on the amount of energy and electricity you use, this can also impact the type of toaster you purchase. As you can imagine, a pop-up toaster uses less energy than a traditional counter toaster or a convection toaster. In general, a toaster uses somewhere between 800 and 1,500 watts of energy when in use. 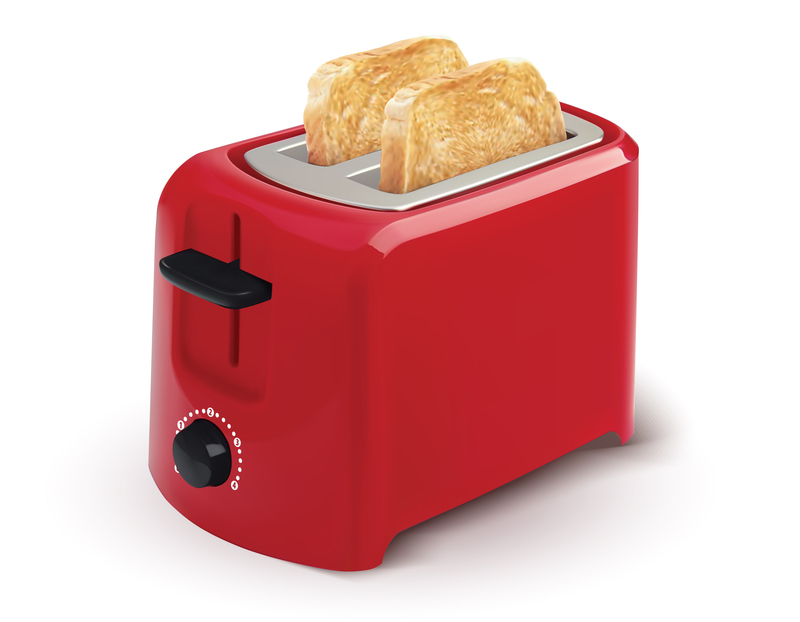 The average toaster uses 1,200, but most pop-up toasters are on the lower end of that number and most counter toasters and convection toasters are on the higher end. Would you be happy with a toaster that only made toast? And only two slices at a time? If so, you’re an easy customer and will likely be happy with the first (and cheapest) toaster you find. Variety of cooking options such as toast, bake, broil, reheat, warm, defrost, convection heating and more. No one likes an appliance that’s hard to use. If it’s too tricky, you’ll likely do something wrong and ruin your food! Thus, you want to find a toaster that’s on par with your technical level. For some, this means old fashioned knobs and buttons and perhaps not too many bells and whistles. Others may prefer a newer, digital model with more features than they can imagine. There’s no wrong answer: the best toaster oven for you may be different than the best toaster oven for your mom. Take a look at a few models and figure out which is easiest for you to use. Nowadays most appliances come with a few accessories and toasters are no different. 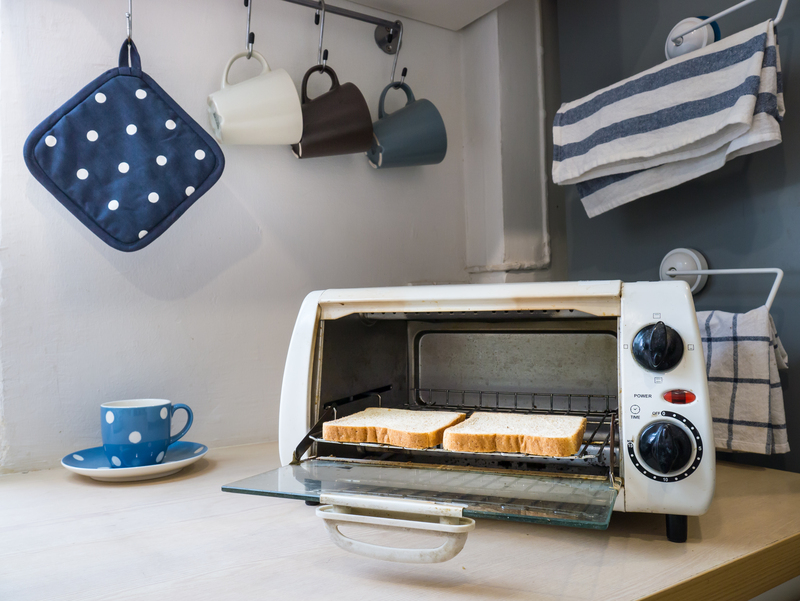 While a pop-up toaster is typically accessory-free, counter toasters and convection toasters can come with bake trays, broil pans, wire racks, and crumb trays. Some even come with pizza stones! Accessories on their own aren’t terribly expensive so you shouldn’t base your toaster decision on what free accessories come with it. They do, however, fall in the “nice to have” category. For most people, cleaning a toaster isn’t at the top of the agenda. It’s typically not even in the top 5! But that doesn’t mean its not important. If you regularly use a pop-up toaster, crumbs can build up and burn. This can not only cause a fire hazard, but also an unpleasant smell. If you have a counter toaster or convection toaster and use it for more than bread items, grease and food splatters can build up as well, which can also catch fire with high temperatures. Toasters aren’t difficult to clean. Some have a self-cleaning function, while others can be cleaned simply by dumping the crumb tray and whipping the interior and exterior with a stainless steel cleaner. If you want a toaster to last, make sure you clean it and take good care of it. All good appliances have warranties, which typically vary based on brand and appliance type. Most toasters have a 1-year limited warranty, while others have a 3-year limited warranty.